Michael Brown complained of "lies and inaccuracies"
For the Federal Emergency Management Agency (Fema), and for the White House, Michael Brown has become a real problem. 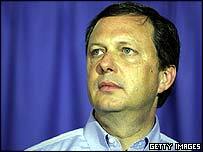 Mr Brown, who was appointed head of Fema by President Bush two years ago, has a background which is open to some question. He is the former head of the Arabian Horse Association but his official biography says he was also in charge of emergency services in the city of Edmond, Oklahoma, in the late 1970s. However, a spokesman for the city told Time Magazine that his role was really that of an intern - nobody reported to him. According to the Washington Post, five of the top eight officials at Fema came to their posts with hardly any experience of handling disasters. The top three, including Mr Brown, had ties to President Bush's election campaign in the year 2000. Mr Bush chose last week to single out Mr Brown for public praise. "Browny, you're doing a heck of a job," he said. But on Friday Michael Chertoff, the homeland security secretary, announced that Mr Brown was moving to other duties. "We are still in hurricane season," he said in Baton Rouge. "We need to be prepared to deal effectively with the possibility of other hurricanes, as well as other disasters, whether they be natural or manmade. Therefore I have directed Michael Brown to return to administering Fema nationally." So Mr Brown will now work in Washington. He has not been sacked but the idea that this was a planned move - part of a wider strategy to deal with the next disaster - will not appear to most Americans to be very credible.